Runs up and intercepts it before it goes out. 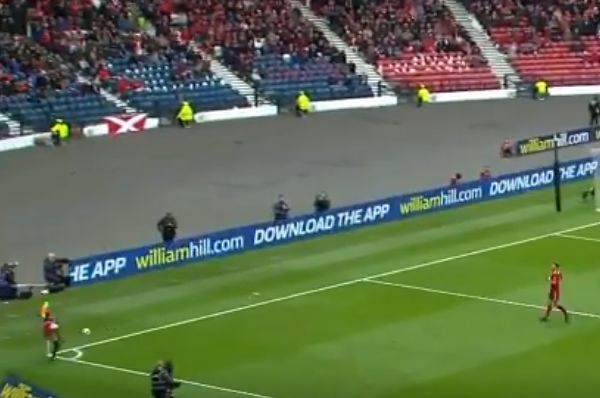 A ball boy intercepted the ball before it went out of play during Celtic’s 3-0 win over Aberdeen in Sunday’s Scottish Cup semi-final at Hampden Park. The ball was going out for a goal kick after Bhoys left-back Kieran Tierney overhit a pass down the line, and the youngster raced over to fulfil his matchday duty. However, he got a bit carried away and wound up keeping the ball in play while sending over another one so the match could continue. Faced with a dilemma, referee Craig Thomson called a drop-ball, with Celtic’s Odsonne Edouard sportingly putting it out for a goal kick. Edouard was on the score sheet along with James Forrest and Tom Rogic as Neil Lennon’s men booked a final date against Hearts. Their passage was helped along by red cards to Dons duo Dominic Ball and Lewis Ferguson.